Amazon Lunches an Efficient Android browser Known As Internet. One of the leading company, Amazon which is a titan of e-commerce, logistics, payments, hardware, data storage, and media. A company who dabbles in plenty more industries. They are a one stop go-to site for online shoppers and merchants alike, a modern necessity that independent sellers love to hate, has introduced an Android web browser app that’s designed to use minimal storage and data. It’s called… Internet. The app offers a web browser that supports private tabs that don’t save browser history and it has a homepage that shows cricket news and more general headlines for its users. 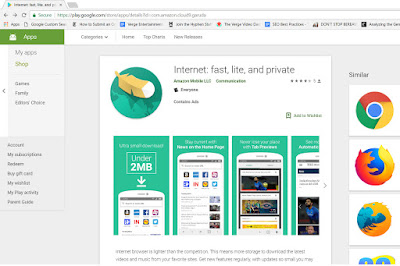 Internet is reminiscent of Facebook Lite, YouTube Go, or Gmail Go, all apps that companies launched as slimmer versions of the original mobile versions. They provide the same basic features as the full apps but typically take up less space of about 2Mb and are optimized for spotty network connections. As US tech giants expand and see increasing adoption from users in developed countries, they also look for opportunities to reach emerging markets that may not yet have access to high-speed internet. ★ Internet is extra small. You’ll love how much more space you have on your phone for videos, music, apps, and everything else. ★ Browse confidently knowing that the Internet app is private. It doesn’t ask for extra permissions or collect your private data like other browsers. How To Configure Your Router Using Web Browser.